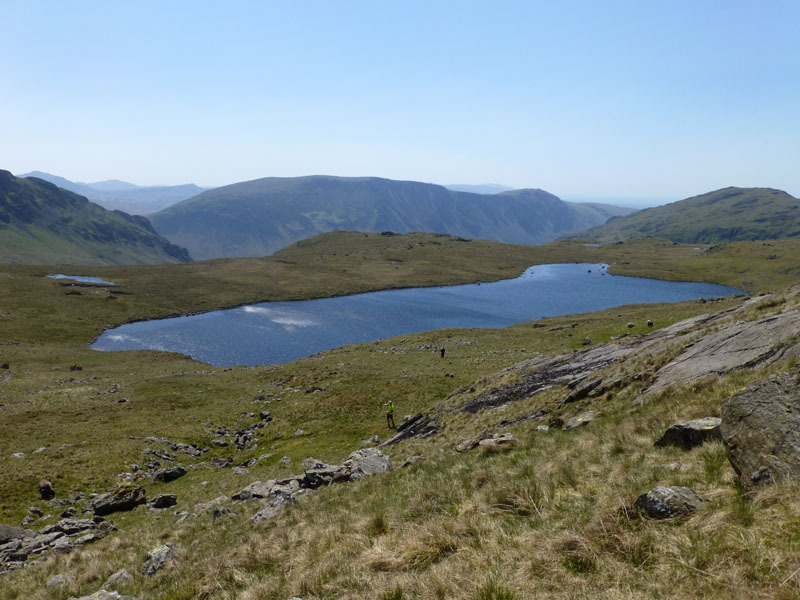 A scene of the utmost peace and tranquility; we are looking forward to another good walk. 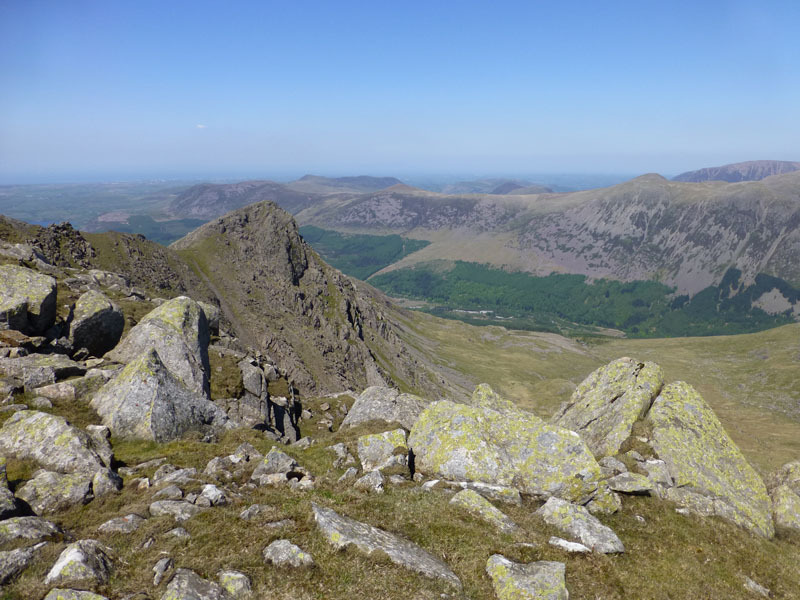 Neil Haslewood will join us from his B&B in Keswick. 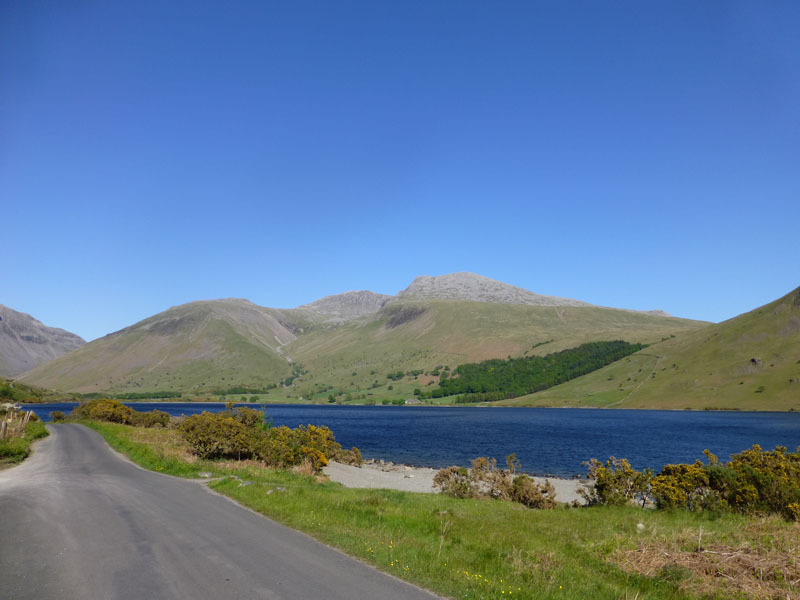 We agreed to meet at Overbeck Bridge car park, Wastwater. 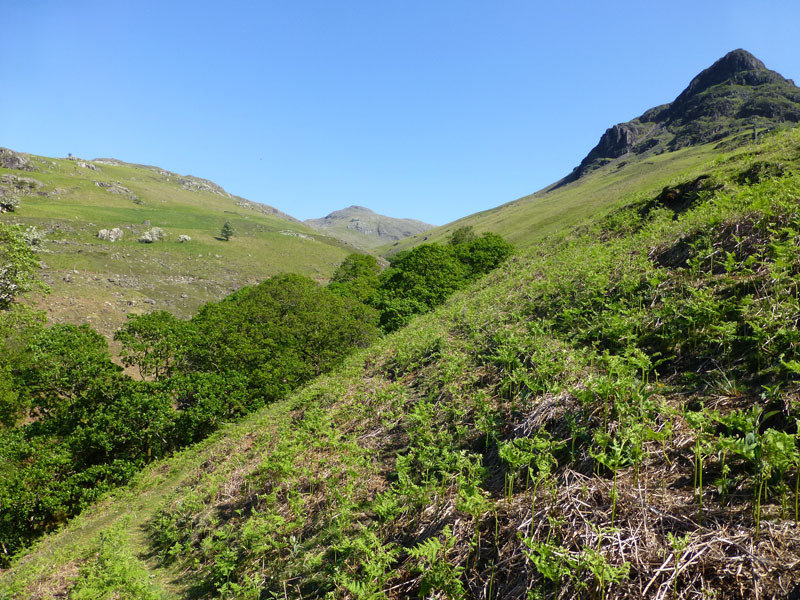 My walking friend, John Paterson, coined a phrase "Unfrequented Wainwright" and sought out some of the routes AW described, but few follow. Well, I think I may have found the original UFW! 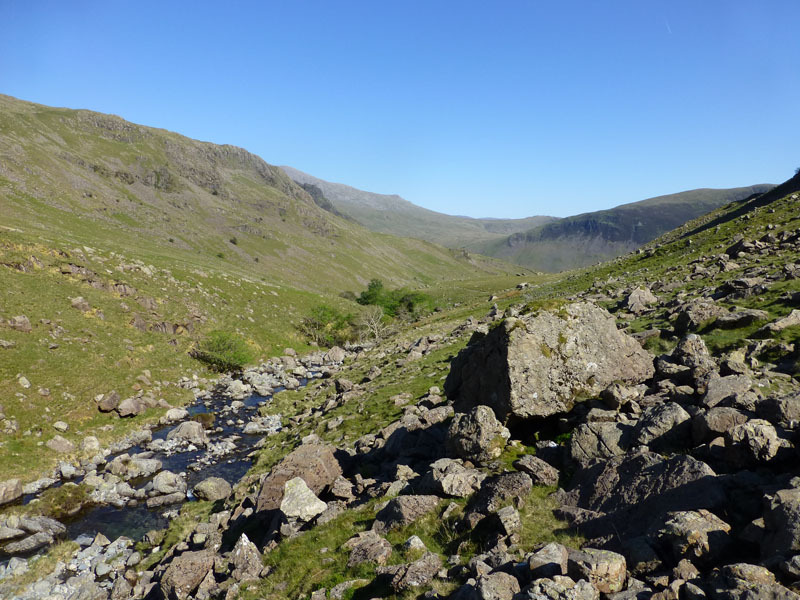 Red Pike from Wasdale (Overbeck Bridge) on Page 5 of Red Pike (W) in Book Seven - Route B. Get your books out to see what I mean. Have you done this one, John? 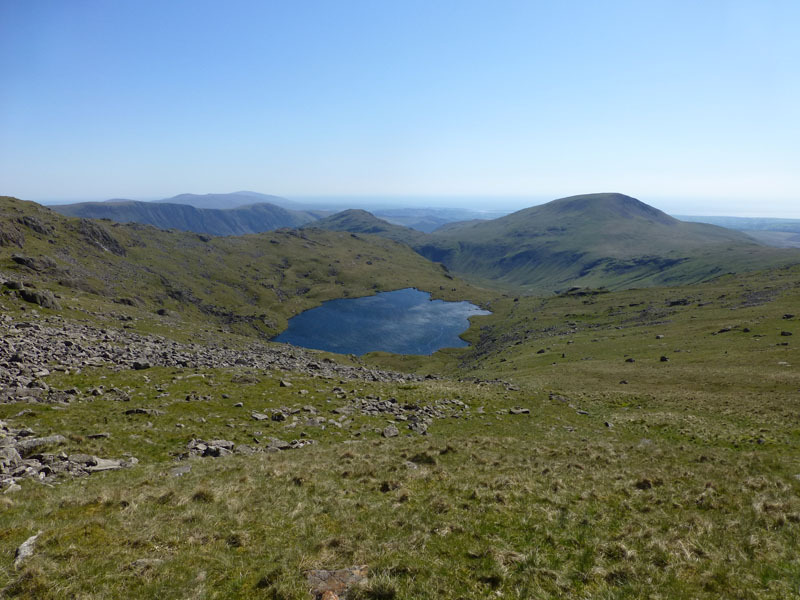 "The graceful peak seen prominently on the ascent is the cairned top at 2629ft, the actual summit being set further back and out of sight" This is a great way to start any Lakeland walk, a wooded vale in warm sunshine and a target to aim for. Scale offered by the fence posts. 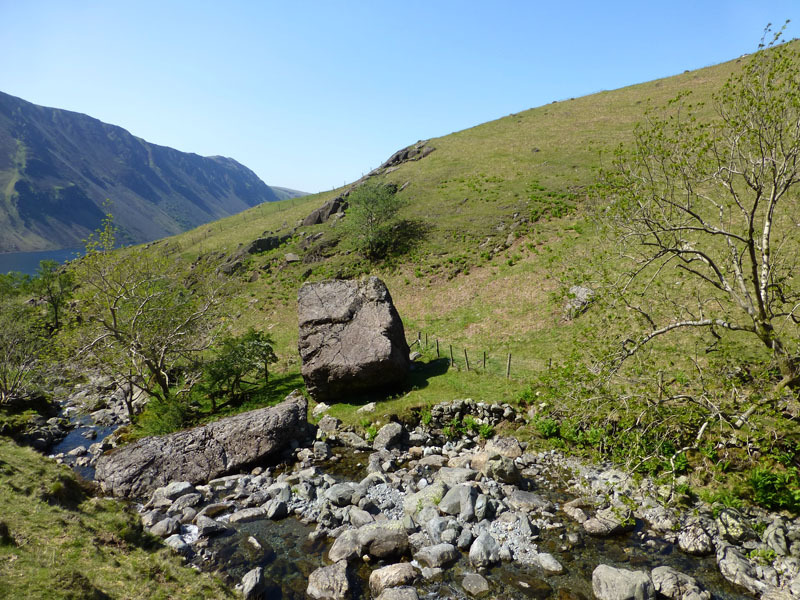 I've mulled this one over and think that the boulder has come off Yewbarrow on our side and bounced across the stream. 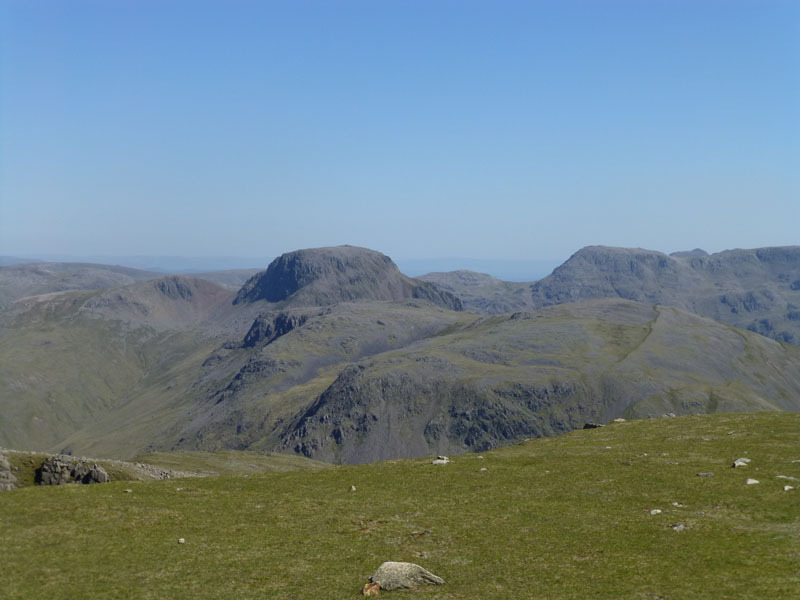 There is no crag on the far side. What do you think? 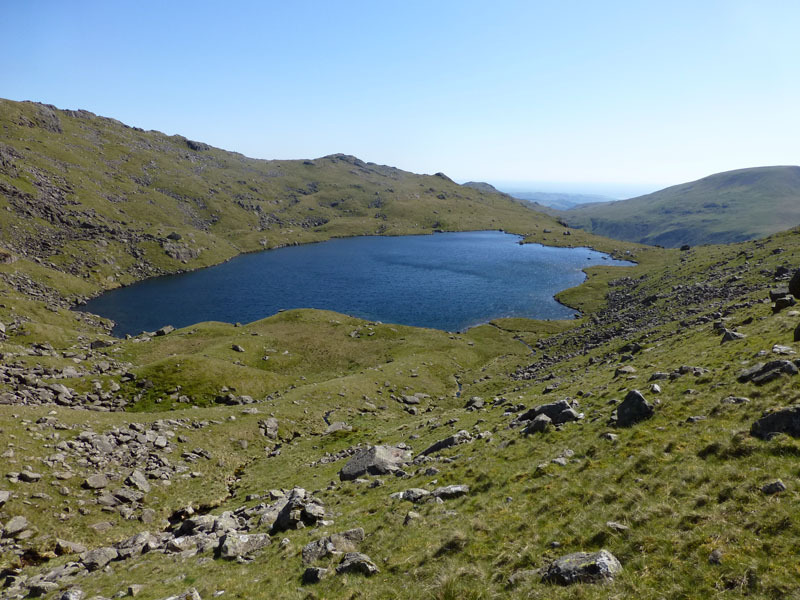 It looks a bit too isolated to be a glacial deposit. Here Route B crosses the footbridge and climbs the wall to a slowly ascending path on the far side. 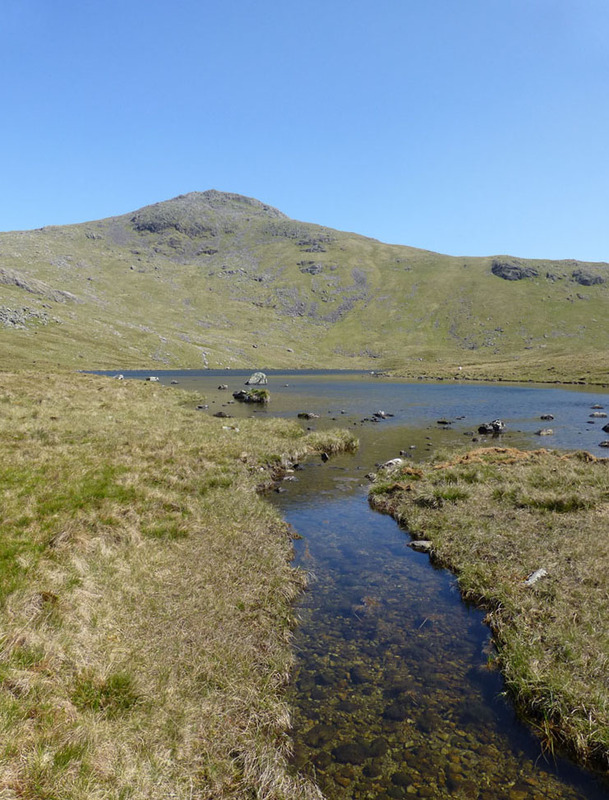 We chose the western variation of B to head for Low Tarn via Brimfull Beck. This bridge was missing in Wainwright's day. 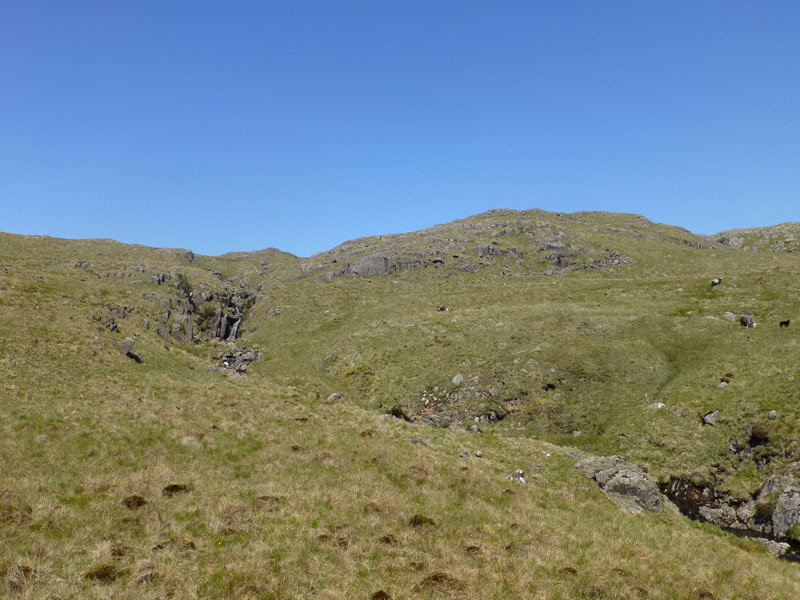 We don't cross here, consistent with the western variation, and we start to climb steeply now. 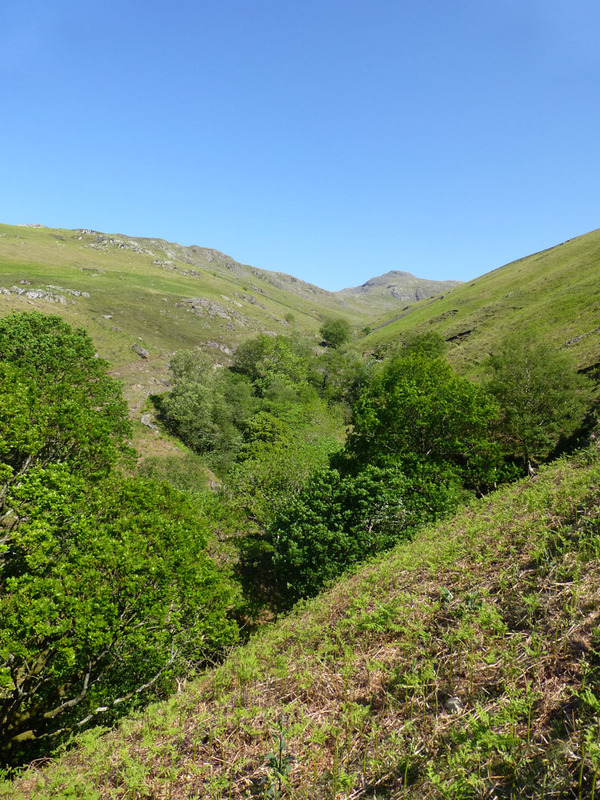 We keep to the left of the beck all the way to Low Tarn. 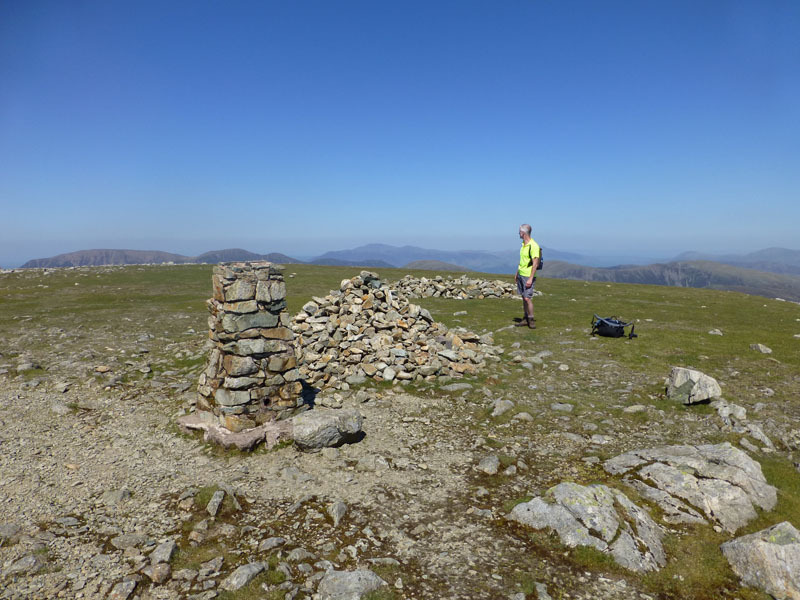 Neil suggested that he would allow us to march on as our full list of objectives would be a bit much for him after the long walk he had enjoyed yesterday with Maggie Allan (fellwalker, Picasa account). That's fair enough, it's a bit too warm for overdoing it. We reckoned our paths would cross again if certain routes were followed. We were grateful for the breeze today, or certainly at this stage of the day - less so later on (!). 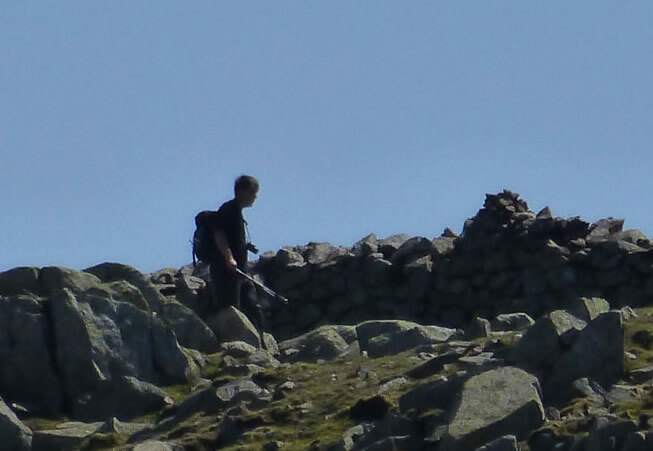 One of the few Lakeland summit cairns that you cannot walk around, this being for health and safety reasons. We're about to visit another, but can you think of any more apart from these immediate neighbours? 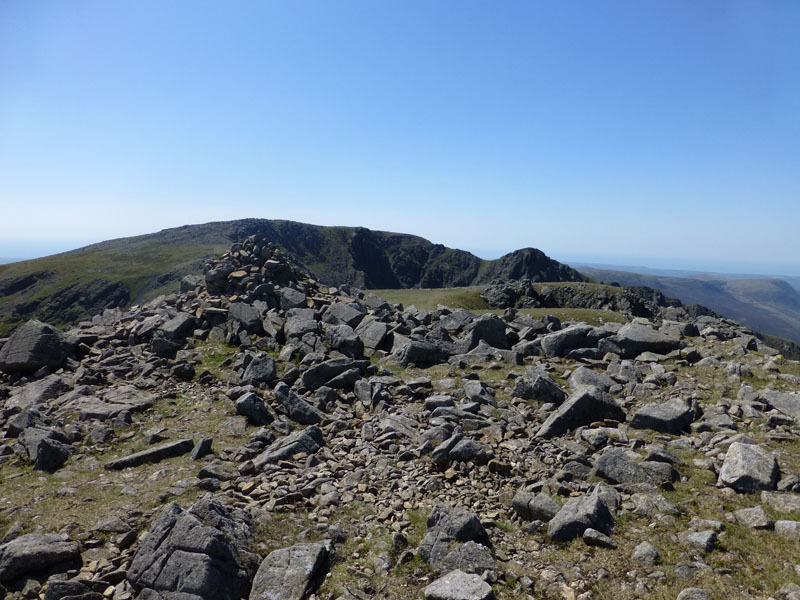 A tricky walk through frost-shattered crag debris to Scoat Fell summit. 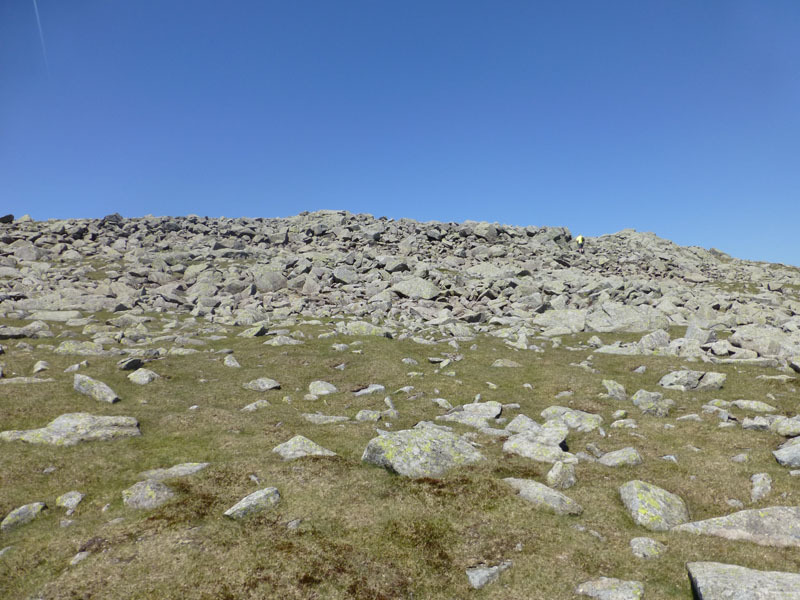 Scoat Fell's highest point is under a wall and so the summit cairn of fewer stones than usual is on top of the wall, again making a circuit of the pinnacle somewhat difficult. 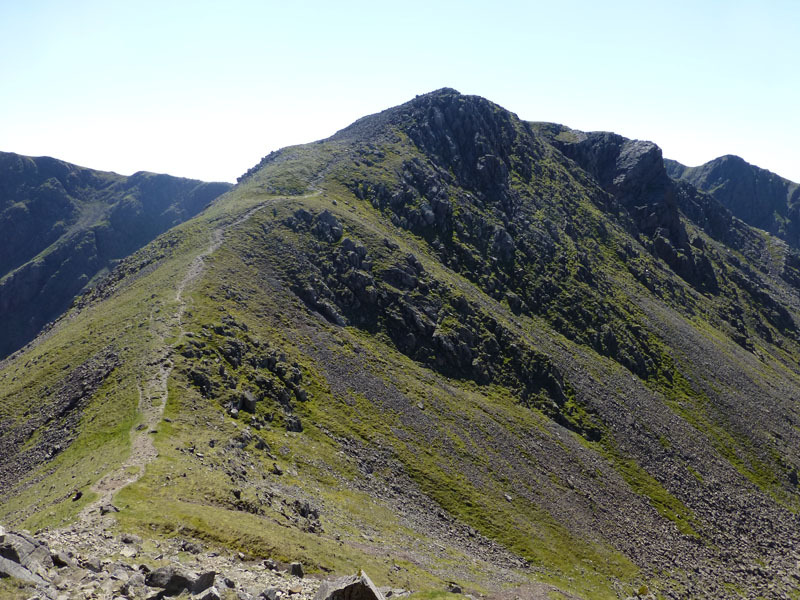 We leave the rucksacs behind and head for Steeple. Cloud encroaches from the east and we begin to regret not carrying waterproofs. 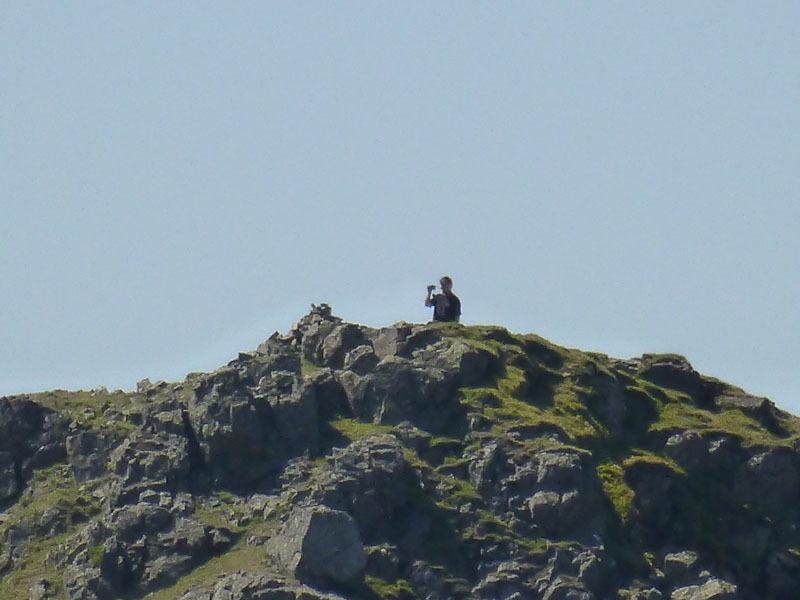 We thought that Neil might appear on Scoat Fell at about this time and with a bit of luck he might get a photo of us on this mighty rock. 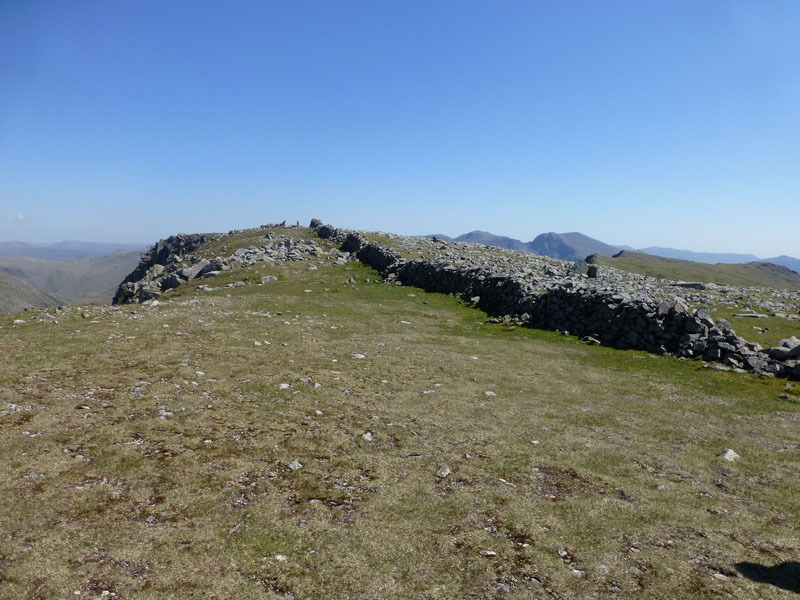 The summit cairn on the wall is also in view. 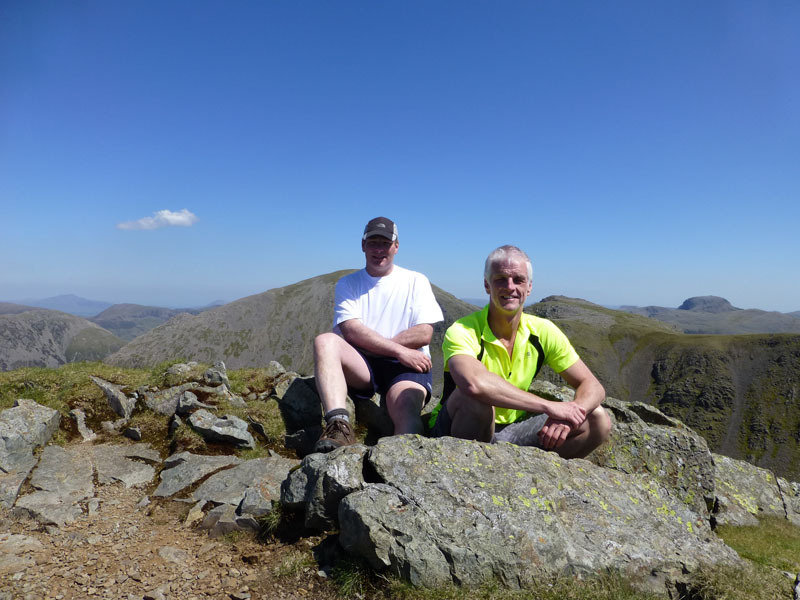 Time will tell if he managed a decent photo of us on Steeple. 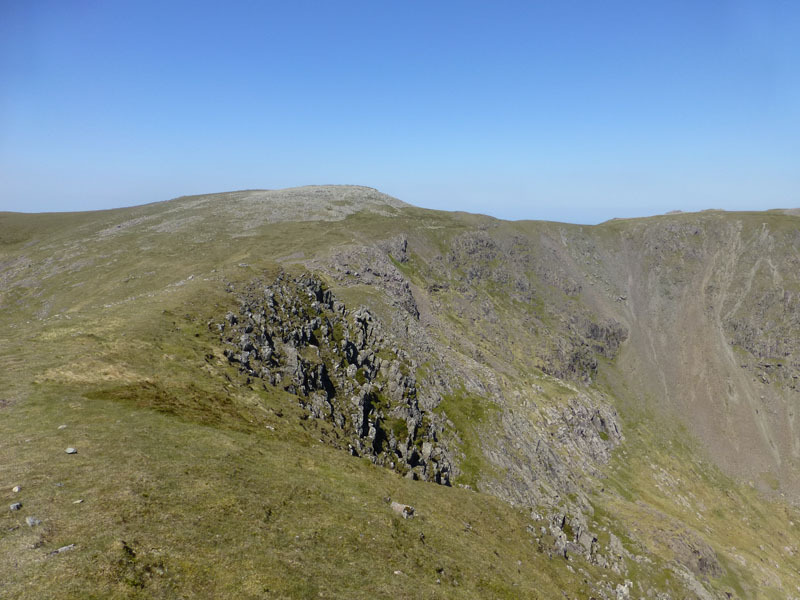 We met Neil on Scoat Fell and then marched off to Black Crag and into Wind Gap for a steep ascent of Pillar. 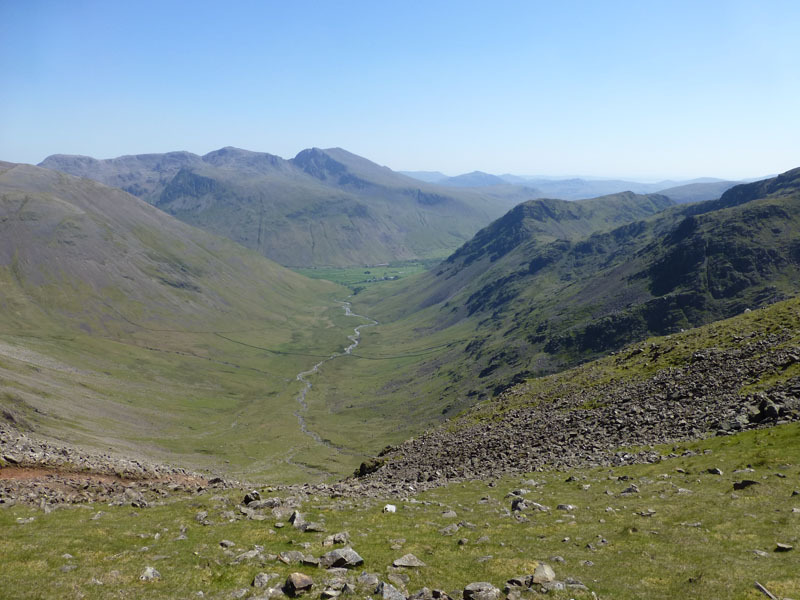 The view down Mosedale is a good one with the Scafell Range well presented. 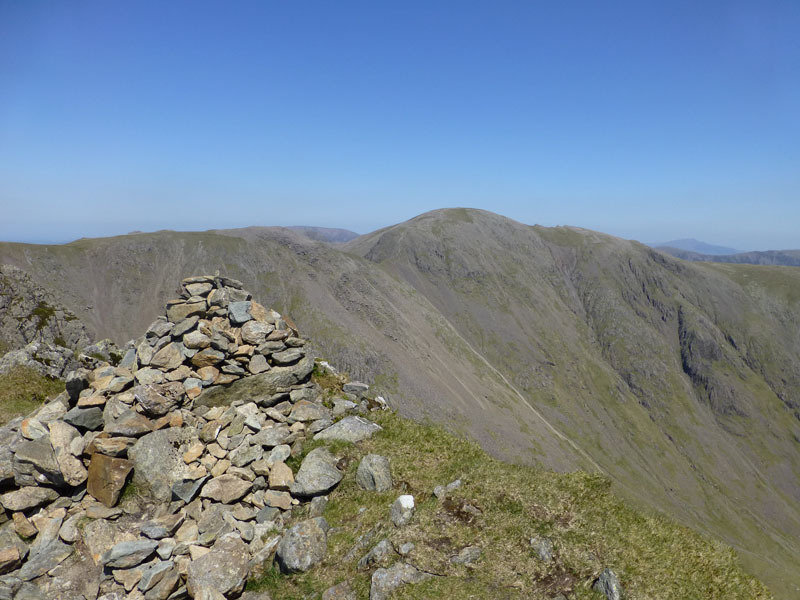 Every fellwalker worth his or her salt yearns to be on top of Pillar on a day like this. 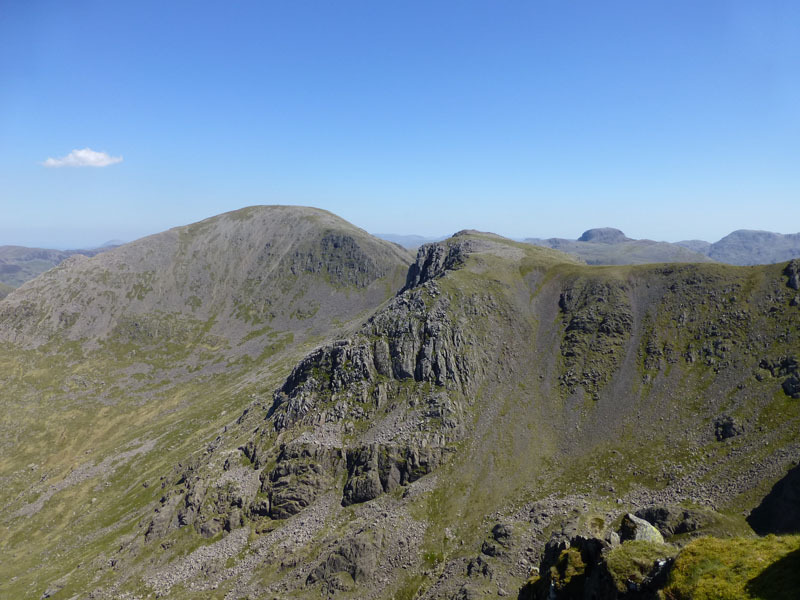 Pillar is never going to be as well populated as Helvellyn, Scafell Pike , Great Gable or Skiddaw. What a treat to be here! Pillar Rock is directly beneath us, luckily the cloud we saw earlier has disappeared and we should stay dry. 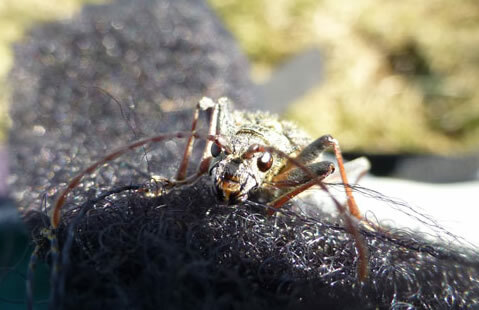 A bug landed on my rucksac as we sat to enjoy the views. Ah well....it's time to go back to the car, just about five miles of mainly downhill walking and we believe we might see Neil again before we get to the cars, depending on just how he chose to occupy his time. 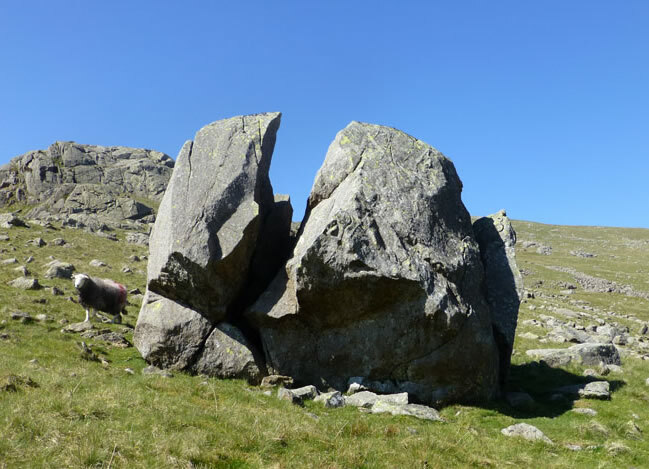 Use a little imagination and look at the right-hand side of the boulder, narrow your eyes. Do you see a face looking back at you? 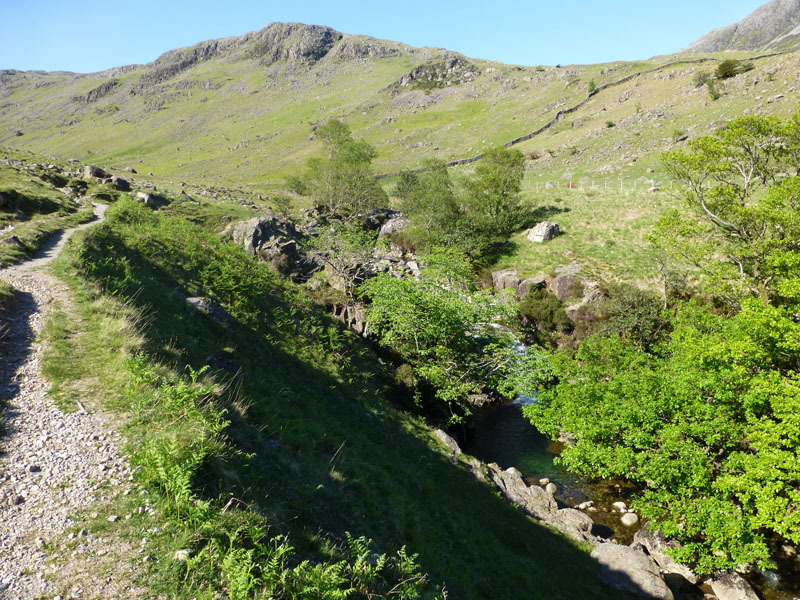 On my version of the OS4 Explorer Map (NW Lakes), it calls this watercourse, "Necker Beck". Mistake, I reckon. Looks like a bit of water fun could be had here. 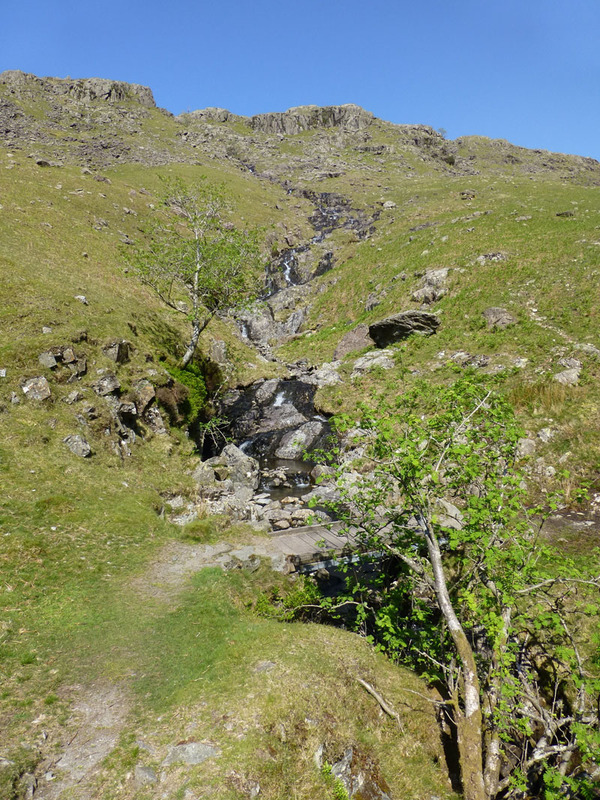 The Nether Beck route down from Scoat Tarn is a long one. 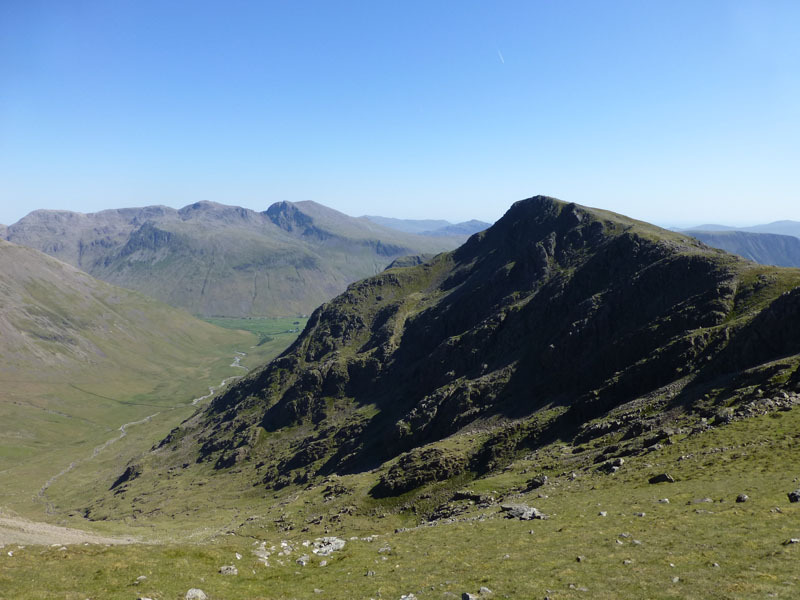 We chose this return route so as to avoid the road walk from Wasdale Head, had we followed the Black Sail Pass down from Pillar. 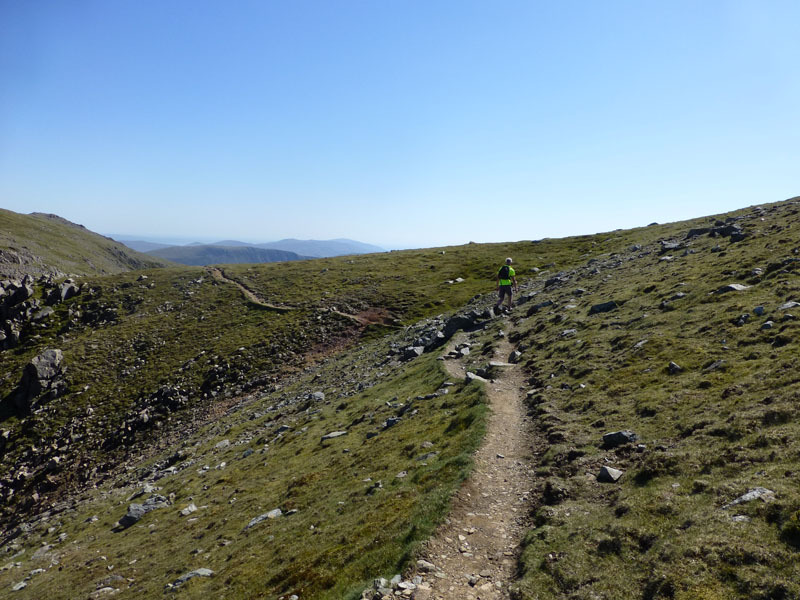 As we reached the final stage of the descent to Netherbeck Bridge, we caught sight of Neil just ahead of us. Good timing! 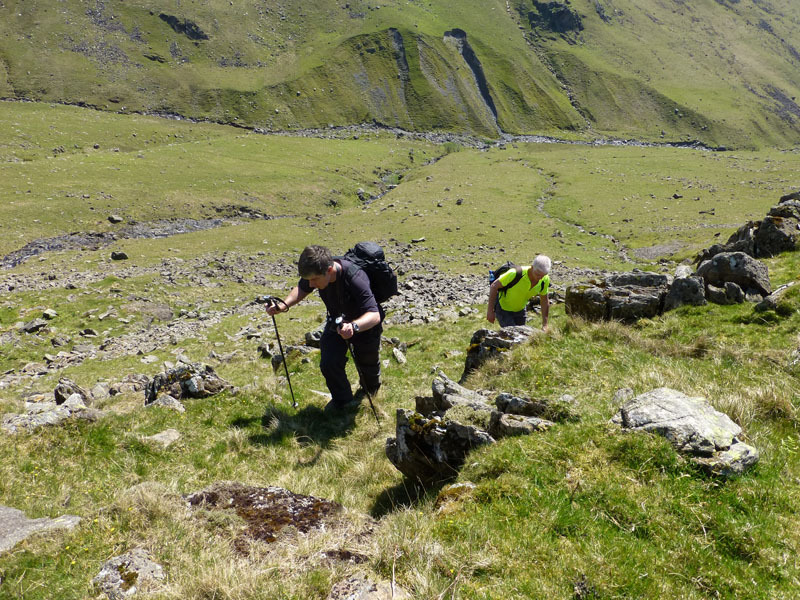 Walkers: Simon Baldwin, Neil Haslewood and Me. Time taken: 7hrs 5mins over a distance of about 11 miles. 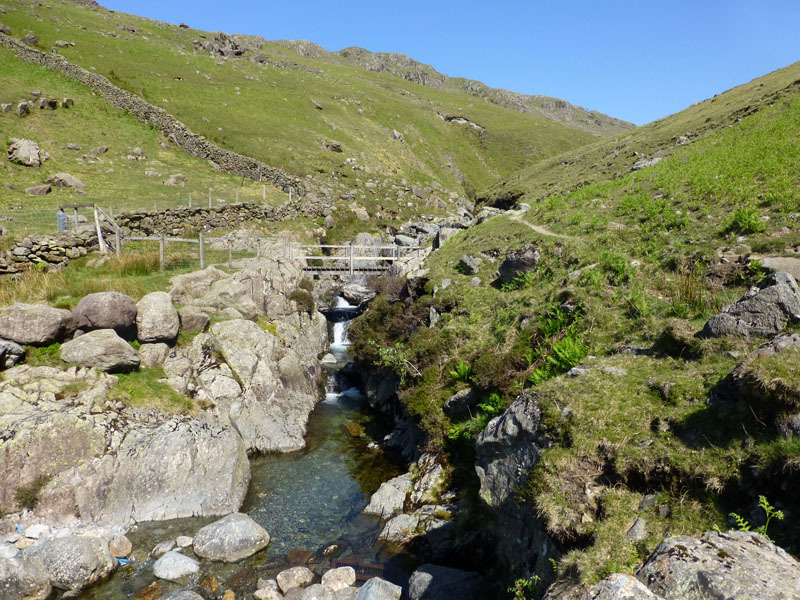 Route: Overbeck Bridge, Over Beck to Brimfull Beck, Low Tarn, Red Pike, Scoat Fell, Steeple, Scoat Fell, Black Crag, Wind Gap, Pillar, Wind Gap, Traverse Path to Scoat Tarn, Nether Beck to Netherbeck Bridge, road to Overbeck Bridge. 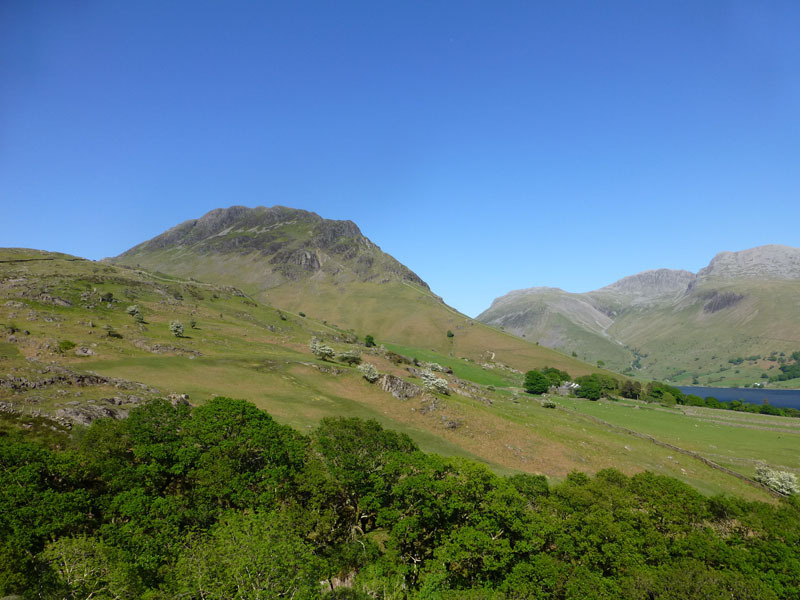 Weather and Conditions: Sunny with a welcome breeze. Greetings Count: Apart from two paddling tourists in the early stages of Overbeck, we had the unfrequented route to ourselves. 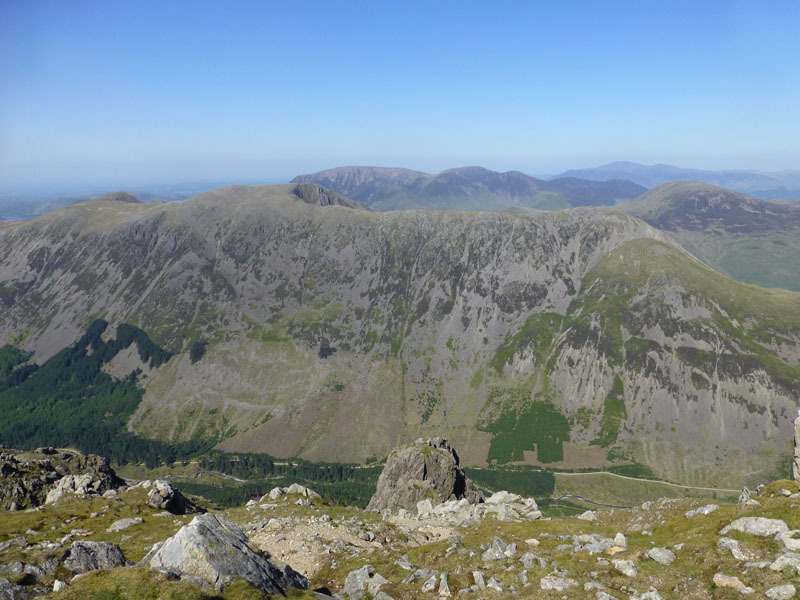 Once on the tops there were a few other walkers dotted about, but nothing to worry seekers of solitude. Richard's Refreshment Review: All three of us had tea in The Strands Inn. 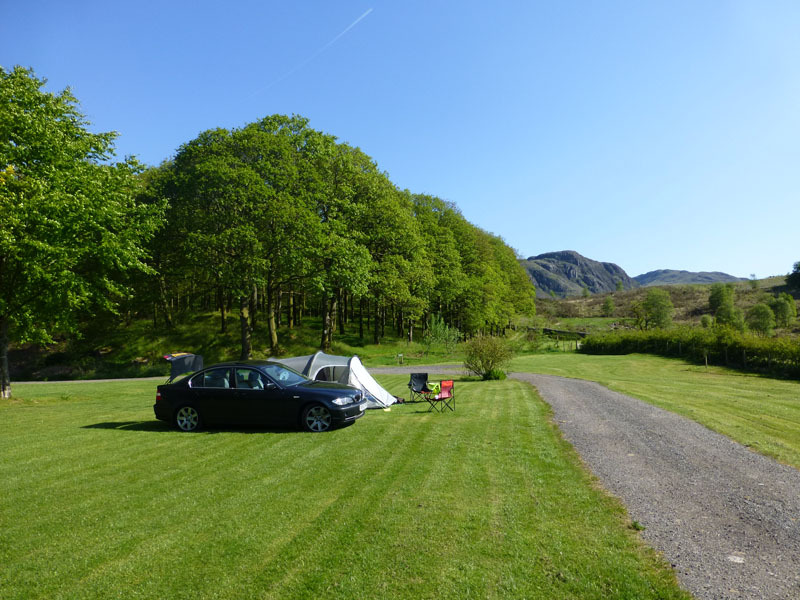 Back at the campsite, Neil and I were sat watching the strong breeze batter the tent and I assured him that no tent I have ever put up has been blown over. Oooops, one especially strong gust and two guy ropes ripped off and the whole thing collapsed. So we did what anyone else would do in a crisis. We went to the pub to consider a strategy. We came home 12hrs earlier than planned, as we would have been heading home in the morning, so not much lost. Worse things happen!